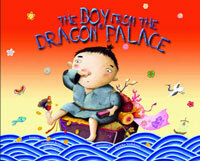 Originally titled "The Snot-Nose Little Boy", this is the tale of a poor flower seller who is offered a gift from the Dragon King who lives beneath the sea…a little boy with a snotty nose. Every time the child blows his nose...the poor man's wish is granted! What should he wish for? A palace...treasure...? When is enough enough...? "some real child appeal in the boy’s wish granting, particularly as it involves an elaborate ritual wherein he wipes his snotty nose first on one sleeve, then the other, then blows “HNNNK! HNNNK! HNNNK!,” and those sharing the story aloud will have a particularly good time with this routine." ...Bulletin of the Center for Children's Books, Nov.Dec.2011. Stories for Young Listeners Award.